Is your work place or shop located where there is street frontage? If you have a window, door, wall or facia space to work with that can bee seen from the street then you potentially have a great opportunity to strengthen your brand and increase exposure for your business. 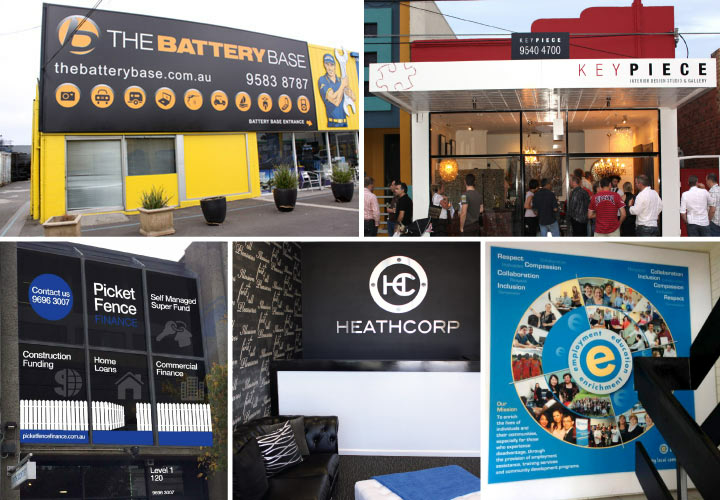 It can be as small as a logo and list of services on your door, or as big as covering an entire front wall and window space with clever signage design and print installation. The overall signage design creative is very important given the exposure and effect it can have, it needs to be a positive reflection of your brand and services, and also something that wont date too much nor confuse the potential traffic that passes. Even if your work place has no street exposure you can always develop a mood inside your office that provides your staff with a more positive working environment, and a work place that is more appealing for your clients to visualise when they visit, a great example of this is your reception area, quite often you can brand the wall behind the reception desk, or even on the front of the desk itself. Even if you have a multi floor office there are areas like the stair well wall that you can display creative elements like your company values which is a great reminder to your staff of what your brand stands for. I have seen the before and after outcomes of clever effective signage design that we have developed for many of our clients, and in every case it has provided more brand exposure and a better working environment, it also gives your workplace an identity rather than just space with no character or purpose. An investment that is worth every cent in my book!